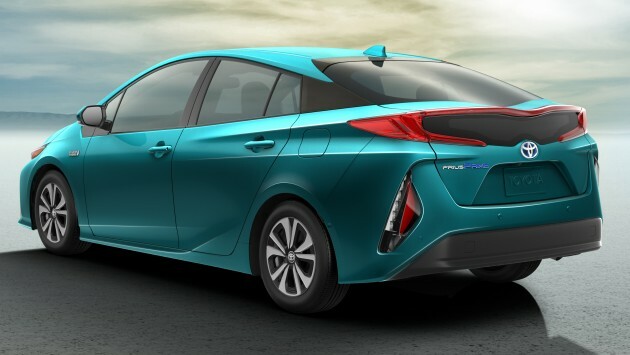 2017 Toyota Prius Prime plug-in hybrid – 1.4 l/100 km! Home » Cars » 2017 Toyota Prius Prime plug-in hybrid – 1.4 l/100 km! The covers have been pulled off the Toyota Prius Prime, the plug-in hybrid version of the new 2016 Prius. This is the first time the PHEV variant features significant styling differences over the regular hybrid, and is probably all the better for it. Visually connecting the headlights is the full-length black front graphic that appears to be inspired by the grille on the Japanese-market Crown Athlete, giving the car a more cohesive look compared to the rather polarising standard car – even though the actual grille remains at the same low-set position. Vertical LED daytime running lights and indicators sit on either side of the bumper, recalling the Mirai fuel-cell vehicle. At the rear, there are C-shaped LED tail lights joined together by a horizontal light bar containing the third brake light – these differ from the regular Prius’ vertical tail lights. Lower down, there are triangular modules containing the indicators, reverse lights and reflectors, also reminiscent of the Mirai. To save weight, there’s a carbon fibre tailgate (a first for a production car), along with extensive use of high-tensile steel in the bodyshell and an aluminium bonnet. 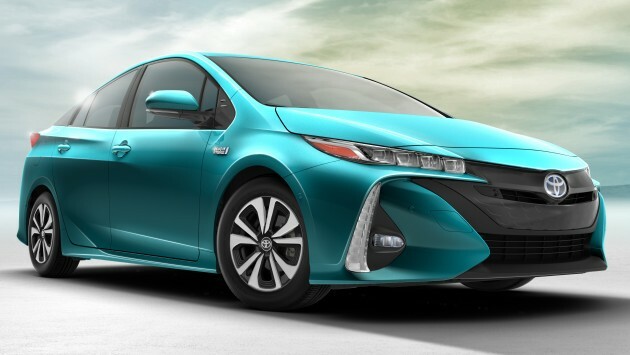 Like the standard Prius, the Prime has a extremely low drag coefficient figure of just 0.24 Cd – expected to be the lowest among production cars – aided by features such as an automatic grille shutter and a double bubble rear windscreen unique to the Prime. There are even more changes inside, including a massive Tesla Model S-style 11.6-inch portrait-format touchscreen. 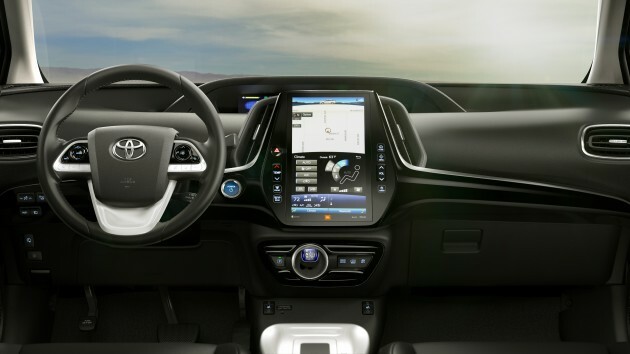 There will also be a suite of Prius Prime apps offered on smartphones that will show vehicle charging status, charge locations, control the air-conditioning and even enable owners to compare eco driving scores with others on social media. Other unique features include a four-seat interior with consoles carrying twin cupholders both front and back, along with the world’s first heat pump with gas injection for the S-Flow automatic climate control that enables the car to heat and cool the cabin in electric-only mode, without the engine running. There’s also a new solar roof charging system with a dedicated battery, another world first. Under the bonnet sits the regular Prius’ 1.8 litre Atkinson-cycle VVT-i engine mated to twin electric motors. Performance figures have not been released just yet, but it is reported that engine outputs could be increased from 97 hp and 142 Nm on the standard hybrid to 105 hp and 147 Nm on the Prime, while the motors could produce as much as 90 hp, up from 71 hp. The 8.8 kWh lithium-ion battery is also twice the capacity as before, enabling the Prime to hit speeds of up to 135 km/h in EV mode, and also delivers a range in EV mode of over 50 km – more than double the current PHEV’s 23 km on the European NEDC cycle. Fuel consumption is also targeted at just 1.4 litres per 100 km, while producing just 32 grams of carbon dioxide per kilometre. Only Japan makers know how to deal with city-car’s petrol efficiency. This actually looks kinda nice. Well, when you are comparing against the Prius and Mirai, nice is a relative term. Thanks to new technology. This will put those oil and gas company and middle nation including Petronas to change their business strategy plan in future. please bring back hybrid scheme. if not, how much the price if it is considered under EEV scheme? otherwise, how much the price if it is under EEV scheme? Design-wise, it’s a huge improvement over the standard Prius. Beautiful and functional. I’m lovin’ it! Weird, can’t find any info on Prius on Toyota Msia website toyota.com.my. Still selling in Msia? 2nd hand can see from 2014 and older only. 1.4l/100km = 71km/l, at 45liter tank size = 3200km per full tank. Sure boh. When Toyota is bringing Prime to Malaysian market ?